Indexed I/O doesn’t slow down with new e-Discovery features as they release Audio to Searchable Text functionality. When data is processed in Indexed I/O audio files are detected and transcribed into searchable text allowing users to include them in their search results. Combine this feature with Indexed I/O’s built in audio player and users now have the industries easiest and most powerful tool to handle audio files, AT NO ADDITIONAL COST. “Audio files have always been difficult to handle in e-discovery. They traditionally require expensive specialized solutions that just aren’t available to the average case.” says Brian McHughs, CEO of Indexed I/O. “We’re bringing big budget technologies to every case, including our latest audio transcription feature” he continued. With today’s voicemail systems integrating seamlessly with email solutions, audio files are becoming more and more prevalent in data collections. 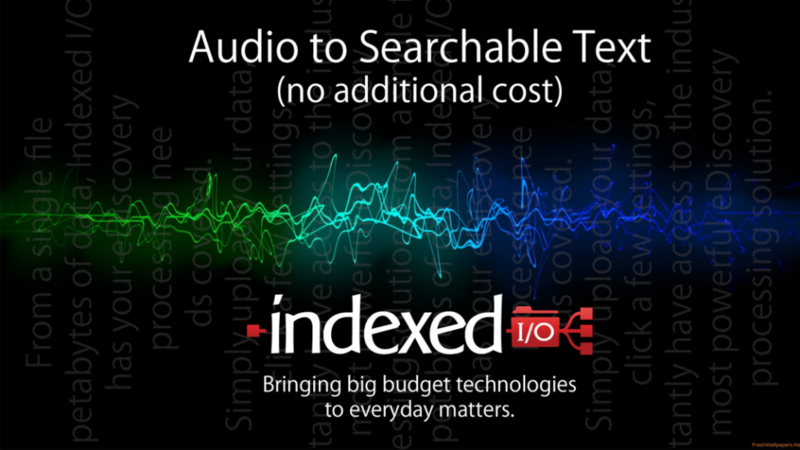 Indexed I/O’s audio to searchable text transcription ensures you have access to all aspects of your case data, letting you quickly and easily handle file types that, until now, were difficult and expensive to make part of your e-Discovery workflow.